DENVER — Hard-throwing German Marquez started with eight straight strikeouts to match a modern-era big league record, and the Colorado Rockies routed the Philadelphia Phillies 14-0 on Wednesday night to pad their lead for the NL’s final wild-card spot. 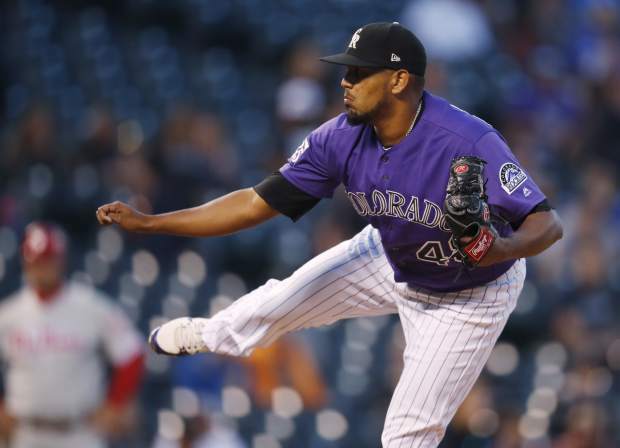 Marquez (14-10) allowed three hits in seven innings and struck out 11 to set a Rockies record with 221 for the season, seven more than Ubaldo Jimenez’s total in 2010. By striking out his first eight batters, he tied a post-1900 mark set by Houston’s Jim Deshaies on Sept. 23, 1986, and equaled by the New York Mets’ Jacob deGrom on Sept. 15, 2014. The overall record of nine was set by New York’s Mickey Welch in an NL game on Aug. 28, 1884. Phillies pitcher Nick Pivetta finally broke the string with a grounder that Marquez fielded only to throw wildly to first for an error. Roman Quinn got Philadelphia’s first hit in the fourth. Colorado open the game with a seven-run fifth that included Dahl’s three-run homer, a two-run shot from Story and another two-run homer by Ian Desmond. All seven runs were scored with two outs. Colorado’s Carlos Gonzalez had two hits and drove in two runs. He’s hitting .363 in his career against the Phillies.